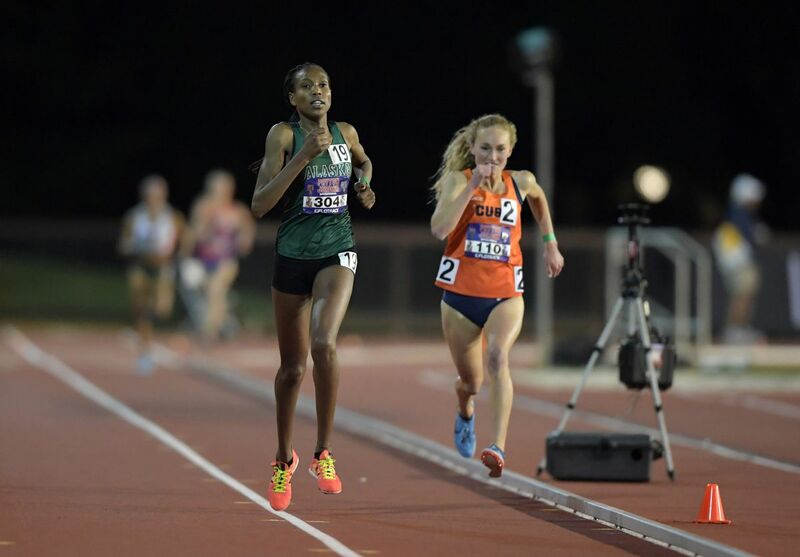 Two runners from Alaska supplied speed, drama and history Thursday night in a talent-packed women's 5,000-meter race at the Payton Jordan Invitational in Palo Alto, California. In the first and most elite of two heats, Boise State's Allie Ostrander was running with the lead pack before tripping and falling during the 11th lap of the 12.5-lap race. Ostrander, a Kenai Central graduate, was in third place after nine laps and fifth after 10. She tripped when the lead pack bunched up, according to a Boise State press release, and finished 18th in the 22-runner field of professional and top collegiate runners. In the second heat, UAA's Caroline Kurgat solidified her status as one of the greatest distance runners in NCAA Division II history by winning with the third-fastest time in DII history. Both women are reigning NCAA champions — Ostrander won last year's Division I steeplechase title, and Kurgat won last November's Division II cross-country championship. Kurgat, a junior from Eldoret, Kenya, was the only Division II athlete in Thursday's field of 40 invited runners. Most of them brought sub-16:00 times into the meet, which attracted some of the top distance runners in the world. Kurgat and Syracuse's Paige Stoner ran away from the rest of the field and staged a thrilling finish in their 18-woman heat. Kurgat, who led from the sixth lap on, triumphed by .05 of a second in 15:41.21. Stoner finished in 15:41.26. Ostrander clocked 15:45.41 in her heat. Pro runners grabbed the top six spots, with Meraf Bahta of Sweden (15:15.33) outdueling Rachel Schneider of the United States (15:15.88) for the victory. The prestigious meet at Stanford University's Cobb Track and Angell Field provided the latest opportunity for Kurgat to shine. After sitting out the 2017 track season as a redshirt, Kurgat this season has posted the second-fastest 10,000-meter time and two of the five fastest 5,000-meter times in Division II history. On March 30, she ran the 10,000 in 32:33.24 at the Stanford Invitational. The fastest DII time is 32:28.57 by Cal State LA's Sylvia Mosqueda in 1987. On April 20 at the Bryan Clay Invitational in Azusa, California, Kurgat ran the 5,000 in 15:43.95, which at the time was the fourth-best time by a DII runner. She shaved 2.74 seconds off that PR on Thursday, knocking her April time into fifth place on the list of all-time bests. The only 5,000 times faster than Kurgat's 15:41.21 are 15:33.83 (Neely Spencer, Shippensburg, 2011) and 15:38.54 (Mandi Zemba, Grand Valley State, 2007). Kurgat last week was named UAA's Bill McKay Athlete of the Year.